Here you will find information about the role of the governing body, governance at The Mary Bassett Lower School, how to become a school governor and a list of our current governors. Governing bodies have a vital role to play in improving school and pupil performance and ensuring that resources are used well to give every child the best possible education. They also make decisions on matters such as performance targets, school policies and the school’s development plan. They oversee the use of the school’s budget, have responsibility to obtain value for money for that budget and are responsible for the appointment of the Headteacher. In addition, governors monitor, support and challenge the headteacher and staff on how well these policies and targets are followed through. They do this by visiting the school, getting to know its strengths and weaknesses, monitoring progress and asking useful questions that foster an ethos of continuous improvement. The Governing Body is required to meet once per term, but at The Mary Bassett Lower School we meet more frequently to ensure the work of the Governing Body is effective. 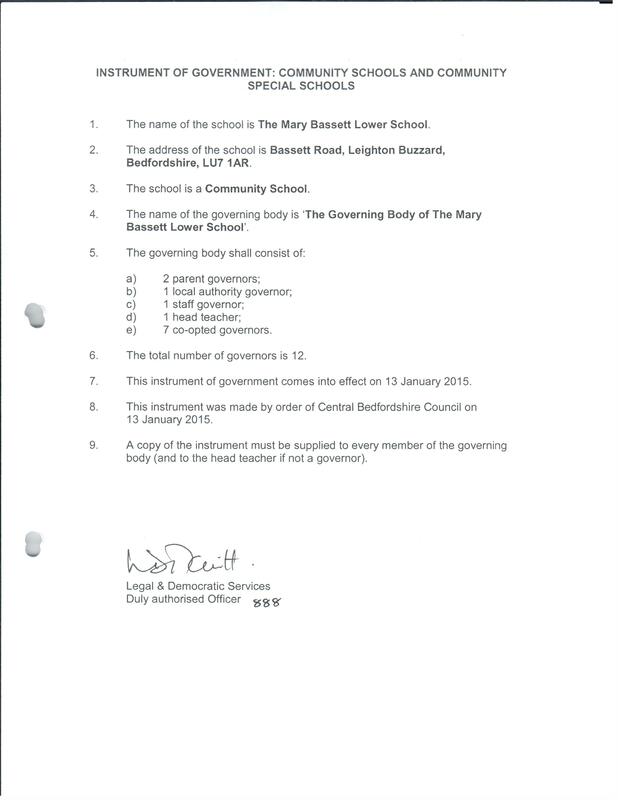 The Mary Bassett Lower School’s Full Governing Body (FGB) is currently constituted of 12 members. The FGB operates under the leadership of a chair and vice-chair with the help of a professional clerk. Governors at The Mary Bassett Lower School come from a range of backgrounds: parents, staff, the local authority and the wider community. We aim to recruit people who have a range of relevant skills and most importantly are committed to acting in the best interests of the children and their learning. The Governing Body of The Mary Bassett Lower School works as a 'whole team' without any separate committees. If you have a concern that touches on the day-to-day life of the school, or an issue that is affecting your child, please talk with their class teacher in the first instance. I have lived in Leighton Buzzard for 20 years. I am an actuary by trade and have held a number of senior positions (including With-Profits Actuary and Deputy Chief Actuary). I spent 23 years of my career at Equitable Life in Aylesbury. In 2014, I joined HSBC to create a new global function to assess actuarial model risk in the HSBC companies around the world. My career has involved managing actuarial departments, financial reporting, advising the Board and playing a key role in corporate governance and strategic risk mitigation activity. I am the Deputy Chair of the Institute and Faculty of Actuaries Life Education and Continuous Professional Development Committee that is responsible for shaping and delivering actuarial technical knowledge for actuaries today and in the future. I have a passion for education and unlocking individual potential. I have always had a keen interest in education so decided to become a school Governor. This has been an opportunity to give back to my local community but also expand my own knowledge and experience. I come from an adult training background and my experience in this area has been useful in fulfilling my role on the Governing Body. I have been involved with The Mary Basset Lower School continuously since my children were at the school. This was initially on the PTA and later as a governor. (They are now 27 and 24 years old!) Professionally, I have also been a Health Visitor in London and Bedfordshire, mostly in Leighton Buzzard for a similar number of years. I enjoy being a Governor and I hope my historical experience of the school and my professional knowledge in health, child development and the local community continues to make me a useful member of the Governing Body. A job move brings me to Leighton Buzzard. I hope to use my ten years experience on a school governing body in the West Midlands to help take The Mary Bassett School forward to provide the best learning environment we can for all our pupils and staff. Having recently moved to the area I've been really keen to get involved with a local school. As a previous governor of 6 years, I enjoyed working to improve the outcome of young people, and am passionate about giving the next generations the best possible start in life. As a director of a small IT consultancy in London, a programmer/designer, former community choir chair and a keen amateur musician, I have a wide range of skills that I think can be assets to The Mary Bassett Lower School. I have lived in Leighton Buzzard for 8 years and have 2 children attending The Mary Bassett School. I have been a police officer in the Metropolitan Police in London for 15 years and have specialised over the last 10 years in high risk domestic violence and partnership working. I currently work part-time in a multi-agency setting, safeguarding vulnerable adults and children and am a trained mediator. I am pleased to be involved in the school both as a parent and as a governor. My desire to serve on the Governing Body stems from my belief in the importance of children’s education. As a governing body we are responsible for overseeing the running of the school and ensuring that The Mary Bassett Lower School gives all children access to an education that sets them off on their learning journey. Being able to represent the children from a teaching perspective gives them a voice from the classroom.